The Environmental Evaluation Modeling System (EEMS) is a tree-based, fuzzy logic modeling system. 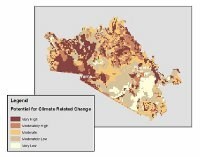 With EEMS, data from different sources and different numerical domains can be combined to answer questions in areas such as current and future potential habitat value, ecological/development conflict, and landscape vulnerability to climate change. 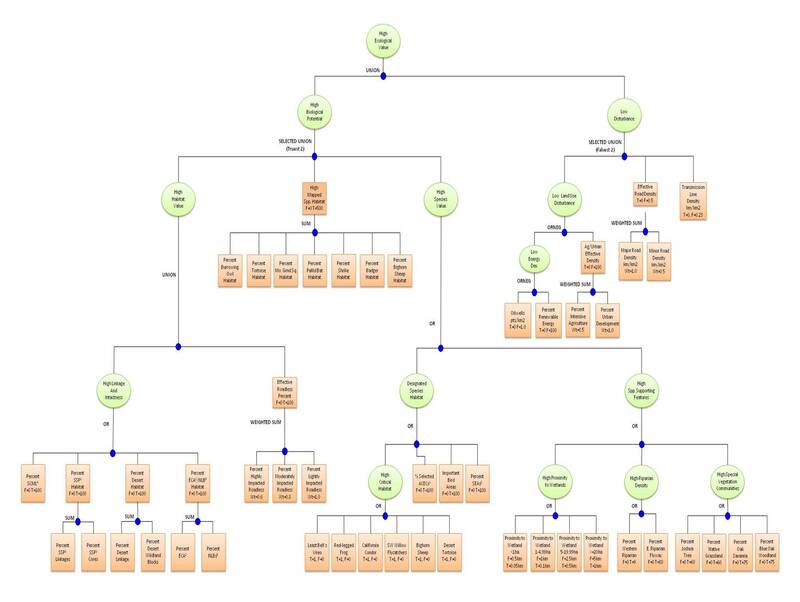 To use EEMS, a user builds a tree-based logic model in which the leaf nodes represent the initial data inputs. Initial data values are converted into fuzzy values (based on the premise that each input value can be represented by value ranging from -1 for fully false to +1 for fully true). Fuzzy logic operations (analogous to basic logic operations such as AND and OR) are used to combine nodes hierarchically until a final value representing the answer to a research question (e.g. What is the relative value of endangered species habitat across our study area?) is produced. EEMS development is lead by Tim Sheehan, a CBI ecological modeler, and has been applied by CBI scientists in a range of ecological evaluations. In the Tehachapis and Southern Sierra (see the hierarchical model below), a model incorporating data for habitat presence, habitat linkage, and disturbance was used to find areas of high ecological value and to provide guidance for reserve design to inform siting Wind Energy. For the Bureau of Land Management Rapid Ecological Assessments of the Sonoran Desert and Colorado Plateau ecoregions, several EEMS models were developed and used to evaluate a variety of current and projected ecological metrics. 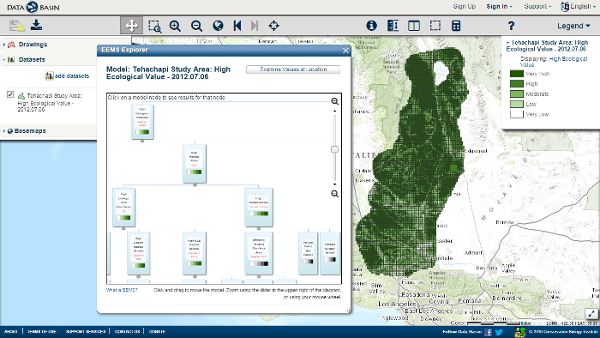 The EEMS Model Explorer tool has been developed and deployed in Data Basin. This tool allows the user to "drill down" through all the data produced by an EEMS model. Through the use of this tool, scientists and land managers can determine what landscape metrics are driving EEMS model results. EEMS is currently implemented for ArcGIS and CSV (comma separated variable) data. A standalone EEMS model creation tool as well as an implementation to work with NetCDF files are planned pending funding. The combination of EEMS and the EEMS Model Explorer provides a powerful system for evaluation model development & analysis as well as land management planning that will only become more powerful as EEMS development continues. For an introduction to EEMS in ArcGIS, an explanation of the fuzzy logic concepts EEMS uses, and a demonstration of the EEMS Model Explorer, please click here to view a recorded webinar with Tim Sheehan. To view a recorded webinar titled "Decision-support for regional reserve design and siting of renewable energy and infrastructure", presented by Jerre Stallcup, Conservation Biology Institute (CBI) Senior Scientist and Tim Sheehan, Ecological Modeler, please click here.